Professionals from across the state gathered in Orlando on September 7, 2017 for the third annual Florida Simulation Summit hosted by Orange County Mayor Teresa Jacobs and the National Center for Simulation (NCS) at the Orange County Convention Center. This year the focus was simulation through virtual, augmented and mixed reality and its applications in transportation, architecture and medicine. To highlight the region’s collaboration in simulation, speakers from Orlando VA Medical Center, Luminar Technologies (autonomous vehicles), the I-4 Ultimate Improvement Project, Institute for Simulation and Training at the University of Central Florida, Walt Disney World Resort, PCL Construction, Nemours Children’s Hospital and the University of Florida presented how they are using simulation in their work to enhance our community. It was evident through all the discussions held throughout the day just how many applications there are for simulation within the Orlando region, from theme parks and commercial space flight, architecture, engineering and construction, as well as medical training and procedures, creating a hub for innovation. Simulation applications for transportation solutions in particular were highlighted throughout the summit. 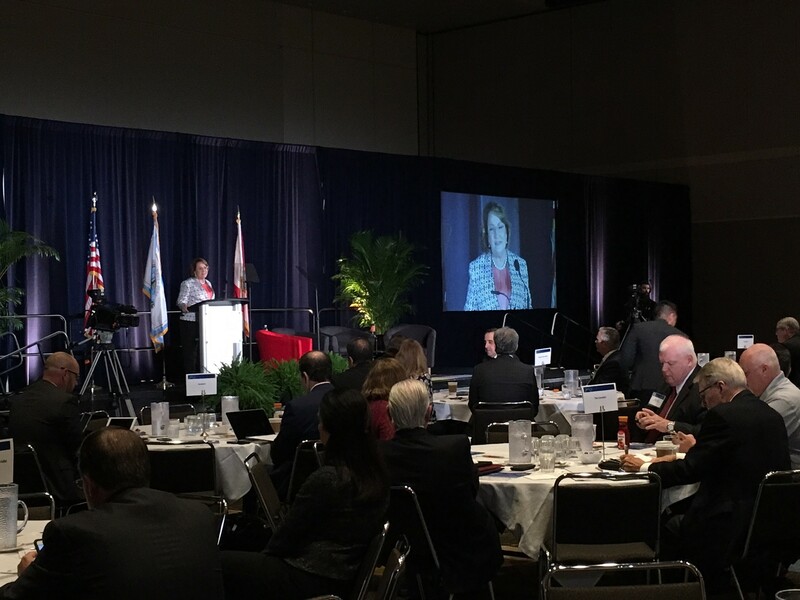 One of the transportation advancements discussed was the work being done with autonomous driving in Central Florida. Recently the U.S. Department of Transportation (DOT) designated Orlando as one of 10 proving ground pilot sites to encourage testing and information sharing around automated vehicle technologies. Due to this designation, Orlando plans to include a new transportation technology testing facility, called SunTrax, on a 400-acre site in Polk County that will include a simulated downtown urban core to test vehicle, pedestrian and bicycle interactions with automated vehicles. Additionally, the Kennedy Space Center will provide a second testing facility where research can be conducted on extreme weather conditions and unusual roadway conditions. Another regional advancement is the I-4 Ultimate Improvement Project, which is taking great care to ensure the maximum benefit to the community with a focus on sustainability. The Institute for Sustainable Infrastructure (ISI) recently honored the project with its Envision Platinum Award, siting the I-4 Ultimate has addressed concerns about threatened wildlife, controlling storm water runoff, and creating public spaces and alternative forms of transportation, such as walking and bike trails. Companies including the I-4 Ultimate Improvement Project, PCL Construction, and Walt Disney World Resort are partnering with the incredible higher education facilities in the region to support academic advancements in simulation with real career opportunities. Central Florida is investing in the future of simulation by working with the County’s many industry partners, including Orange County’s MS&T Blue Ribbon Commission, the Orlando Economic Partnership, Florida High Tech Corridor, Team Orlando, the City of Orlando, Central Florida Research Park, the National Center for Simulation, the Metro Orlando Defense Task Force and the Orange Technical College.